The tutorial provides a list of Excel basic formulas and functions with examples and links to related in-depth tutorials. Being primarily designed as a spreadsheet program, Microsoft Excel is extremely powerful and versatile when it comes to calculating numbers or solving math and engineering problems. It enables you to total or average a column of numbers in the blink of an eye. Apart from that, you can compute a compound interest and weighted average, get the optimal budget for your advertising campaign, minimize the shipment costs or make the optimal work schedule for your employees. All this is done by entering formulas in cells. This tutorial aims to teach you the essentials of Excel functions and show how to use basic formulas in Excel. Before providing the basic Excel formulas list, let's define the key terms just to make sure we are on the same page. So, what do we call an Excel formula and Excel function? Formula is an expression that calculates the value of a cell. For example, =A2+A2+A3+A4 is a formula that adds up the values in cells A2 to A4. Function is a predefined formula already available in Excel. Functions perform specific calculations in a particular order based on the specified values, called arguments, or parameters. Clicking the function's name will turn it into a blue hyperlink, which will open the Help topic for that function. Tip. You don't necessarily have to type a function name in all caps, Microsoft Excel will automatically capitalize it once you finish typing the formula and press the Enter key to complete it. What follows below is a list of 10 simple yet really helpful functions that are a necessary skill for everyone who wishes to turn from an Excel novice to an Excel professional. =SUM(A2:A6) - adds up values in cells A2 through A6. =SUM(A2, A6) - adds up values in cells A2 and A6. =SUM(A2:A6)/5 - adds up values in cells A2 through A6, and then divides the sum by 5. Tip. The fastest way to sum a column or row of numbers is to select a cell next to the numbers you want to sum (the cell immediately below the last value in the column or to the right of the last number in the row), and click the AutoSum button on the Home tab, in the Editing group. 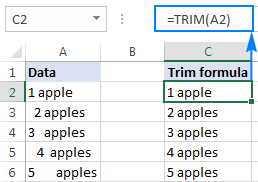 Excel will insert a SUM formula for you automatically. Excel Sum formula examples - formulas to total a column, rows, only filtered (visible) cells, or sum across sheets. Excel AutoSum - the fastest way to sum a column or row of numbers. SUMIF in Excel - formula examples to conditionally sum cells. SUMIFS in Excel - formula examples to sum cells based on multiple criteria. Having a closer look at the last formula from the previous section (=SUM(A2:A6)/5), what does it actually do? Sums values in cells A2 through A6, and then divides the result by 5. And what do you call adding up a group of numbers and then dividing the sum by the count of those numbers? Yep, an average! Excel AVERAGE - average cells with numbers. Excel AVERAGEA - find an average of cells with any data (numbers, Boolean and text values). Excel AVERAGEIF - average cells based on one criterion. Excel AVERAGEIFS - average cells based on multiple criteria. In both formulas, you use the so-called "whole column reference" (A:A) that refers to all of the cells within column A.
Excel COUNT function - a quick way to count cells with numbers. Excel COUNTA function - count cells with any values (non-empty cells). Excel COUNTIF function - count cells that meet one condition. Excel COUNTIFS function - count cells with several criteria. If your obviously correct Excel formulas return just a bunch of errors, one of the first things to check is extra spaces in the cells referenced in your formula (You may be surprised to know how many leading, trailing and in-between spaces lurk unnoticed in your sheets just until something goes wrong!). Need to find out how many characters are in cell A2? Just type =LEN(A2) into another cell. Want to get the total count of characters in a range or cells or count only specific characters? Please check out the following resources. AND returns TRUE if all of the conditions are met, FALSE otherwise. OR returns TRUE if any of the conditions is met, FALSE otherwise. While rarely used on their own, these functions come in very handy as part of bigger formulas. How to concatenate in Excel - formula examples to combine text strings, cells and columns. =TODAY() to insert the today's date in a cell. =NOW() to insert the current date and time in a cell. The beauty of these functions is that they don't require any arguments at all, you type the formulas exactly as written above. How to insert today's date in Excel - different ways to enter the current date and time in Excel: as an unchangeable time stamp or automatically updatable date and time. Excel date functions with formula examples - formulas to convert date to text and vice versa, extract a day, month or year from a date, calculate the difference between two dates, and a lot more. Now that you are familiar with the basic Excel formulas, these tips will give you some guidance on how to use them most effectively and avoid common formula errors. Once you have typed a formula into a cell, there is no need to re-type it over and over again. Simply copy the formula to adjacent cells by dragging the fill handle (a small square at the lower right-hand corner of the cell). To copy the formula to the whole column, position the mouse pointer to the fill handle and double-click the plus sign. Note. After copying the formula, make sure that all cell references are correct. Cell references may change depending on whether they are absolute (do not change) or relative (change). 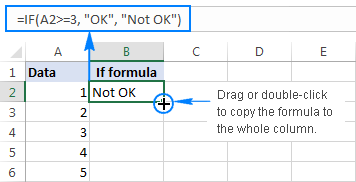 For the detailed step-by-step instructions, please see How to copy formulas in Excel. Select all cells with your formulas. Press Ctrl + C to copy the selected cells. Right-click the selection, and then click Paste Values > Values to paste the calculated values back to the selected cells. Or, press the Paste Special shortcut: Shift+F10 and then V.
For the detailed steps with screenshots, please see How to replace formulas with their values in Excel. Any text included in your Excel formulas should be enclosed in "quotation marks". However, you should never do that to numbers, unless you want Excel to treat them as text values. Copy the formula down to other cells and you will have a column of 1's and 0's that can be calculated without a hitch. At first sight, the output is normal - the same column of 1's and 0's. Upon a closer look, however, you will notice that the resulting values are left-aligned in cells by default, meaning those are text strings, not numbers! If later on someone will try to calculate those 1's and 0's, they might end up pulling their hair out trying to figure out why a 100% correct Sum or Count formula returns nothing but zero. Please remember this simple rule: numbers supplied to your Excel formulas should be entered without any formatting like decimal separator or dollar sign. In North America and some other countries, comma is the default argument separator, and the dollar sign ($) is used to make absolute cell references. Using those characters in numbers may just drive your Excel crazy :) So, instead of typing $2,000, simply type 2000, and then format the output value to your liking by setting up a custom Excel number format. When crating a complex Excel formula with one or more nested functions, you will have to use more than one set of parentheses to define the order of calculations. In such formulas, be sure to pair the parentheses properly so that there is a closing parenthesis for every opening parenthesis. To make the job easier for you, Excel shades parenthesis pairs in different colors when you enter or edit a formula. If all of a sudden your Excel formulas have stopped recalculating automatically, most likely the Calculation Options somehow switched to Manual. To fix this, go to the Formulas tab > Calculation group, click the Calculation Options button, and select Automatic. If this does not help, check out these troubleshooting steps: Excel formulas not working: fixes & solutions. This is how you make and manage basic formulas in Excel. I how you will find this information helpful. Anyway, I thank you for reading and hope to see you on our blog next week. 207 Responses to "Basic Excel formulas & functions with examples"
Enter =B2 in cell D32. I like information, you providing,, Further request you to send me detail formulas specially for the condition "IF".I think it will help in future. Please note, concatenation turns the output into a text string, and you won't be able to use the result in further calculations. I am trying to figure out how to get excel to recognize if a cell populates or not. I want cell G39 to read cell G40. G40 has a formula that sometimes populates from a data worksheet. When it populates I want G39 to display cell G3. If it doesn't I want it to stay blank. =IF(NOT(ISBLANK(G40)),G3,"") This doesn't work because it reads the formula so the cell isn't really blank. =IF(G40"",G3,"") This seems to have the same problem. Your board isn't posting the greater than and less then signs that would come after the G40 and before the "" in the 2nd formula. That formula still doesn't work with those included. Sorry for messing around with your formula, it's because of a silly bug in our blog engine that we are unable to fix. if G40 has a value, G39 displays G3. if G40 is an empty string, G39 is blank (empty string). if G40 has an error, G39 displays an error. What is wrong about this behavior? Please clarify. How to use pipe formula for series of invoice NOs. The (G40"",G3,"") would work if I didn't have a formula in G40. I think the formula that's puling data from a different tab was being recognized. hi, may I know that if a column have 2 words, but I want to separate it to 2 columns, what is the fomula? then I want to separate 123456 and abc to 2 columns. If you don't have too many of these things to separate, then just use the Text-to-Columns tool. Under Data select the Text-to-Columns and with your data use the Delimited option and select the space checkbox as the delimiter. That will separate the data into two columns. Otherwise where the data is in A1 you might want to use RIGHT(A1,3) to get the abc characters into a cell. There are several techniques to split text strings. AbleBits has a couple of good articles that explain some of these techniques. please send me simple formula for excel in my mail id . These Formulas are really helpfull .Please give detail info of If Formula. Can you use formulas to calculate hours worked? I do lot of timesheet work and be good to know. For example 7.50am start to 6.20pm finish ? I have a spreadsheet with imported values from a bank statement. It’s saved as a spreadsheet not csv data. The first column is the date, the second is the transaction the third is the amount etc till the sixth which is my own description that I added. Is there a way to pick the whole line out and place it in another row with all the same data? Example, the last column could be house, apartment, nm house, condo or trailer park. I want to show a msgbox so that if the c:\folder above nothing is selected with in the sub folder to this msgbox "No Month Was Selected" show in a MsgBox and if a Month is selected it goes right to the month selected. i have gone through yours tutorial it is amazing thanking you too make our life easy. i have one more request from you, i do asset validation checking all the asset is correctly captured such that they can be processed in software to make life easy to our organization. Please suggest me number of formulas and Technic i can used to do my validation more accurate. currently i am using vlookup, pivot table, mid, clean, trim, iferrror, and many more. I want know how hloockup work in excel sheet and what is the use of this formulas . SIR WITH EXAMPLES SHOW IN EXCEL HOW TO CALCULATE COMPOUND INTEREST. How can some one understand all this? I have filled the colour to the one of the cell in excel. if I doubleclick the coloured cell. it should show the value which I assighed it. my question: there is any formula to add value, example the value should be in background. by doubleclick the colourd cell, it shows the value. Can you please send me a link for a tutorial on creating a sales lead template with if and then being a 2 week window for contacting those leads? How you use percentage formula in Excel. Rup = Rup & " Crore "
Rup = Rup & " Lakh "
Rup = Rup & " Thousand "
Rup = Rup & WORDs(Val(Left(FIGURE, 1))) + " Hundred "
Rup = Rup & " Paise "
Hi, I'm tring to find a formela to divide the input value to the next cells as 100s. and if A2 changed to 300 then B2=100, C2=100, D2=100 and E2=0. Please note that this is an array formula. You should enter this formula into a cell in any column and hit Ctrl + Shift + Enter to complete it. 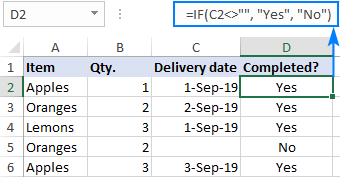 Copy the formula down along the column if necessary by selecting the cell where you've entered the formula and drag the fill handle (a small square at the lower right-hand corner of the selected cell) down. Please show me the formula I need to use to add columns B11 thru H11 in addition to adding 10% all in one cell. Can help me set the formula, thanks. I want to write 06 in formula bar but it always show 6. Please any solution give me Sir. Sir I want to know the how to convert the no(56) into the letter(Fifty Six) in excel with using the formula of excel or using function of excel. hello mam i have no knoweldge of excel.so you can tell , how do you use ecxel in the computer. How am I use countifs in any data. Please man /sir replayed me how can i use countifs cintex in any data. where, F12 is the cell, which you want to copy. Will you please tell me, how to use macros? I am pretty new to Excel. I cant get this formula right. Please help.